Sorry. I had to get that out of the way. It positively drives me batty whenever I see people misspelling banh mi. 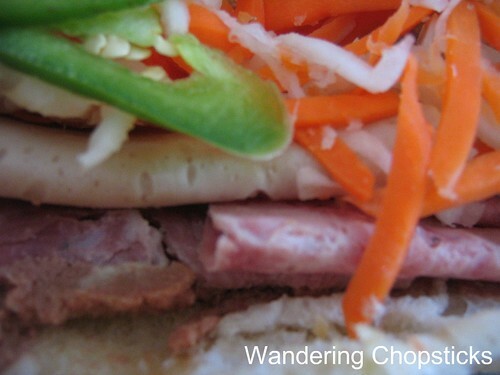 (There's even a few blogs that have named themselves after banh mi but then misspell it in their title! Why would you name your blog and not even bother to check the spelling? ARGH!!!) It's always, always N before H. As far as I know of, there is no such word in the Vietnamese language that has H before N. (Please correct me if I'm wrong.) That only happens in English or Korean with words like John and Ahn (Which is where I'm assuming the confusion comes in. And I won't even get into the whole Vietnamese and Koreans are two different cultures with different alphabets...). OK, now that I've gotten that out of the way... Great deal huh? 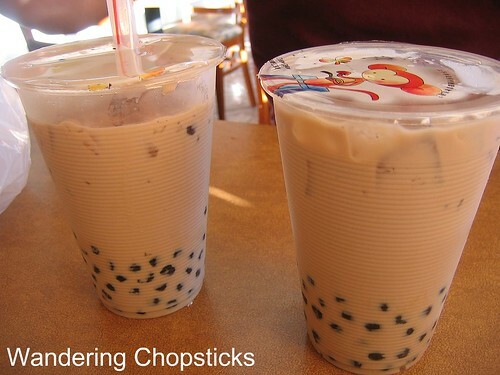 It's an even better deal when you find out that the boba milk tea is $2, making them only $1 each! Several months back when one of the newest branches of Banh Mi & Che Cali opened in Alhambra, I decided to check them out. I had long been going to the one in Little Saigon, namely the Banh Mi & Che CALI Bakery - Westminster location on Bolsa and Magnolia. I like their lighter, buttery bread, and the schmear of pate in each sandwich. Can't beat their 3 for $3 deals. Well, now it's 3 banh mi for $4.50. Darn inflation! 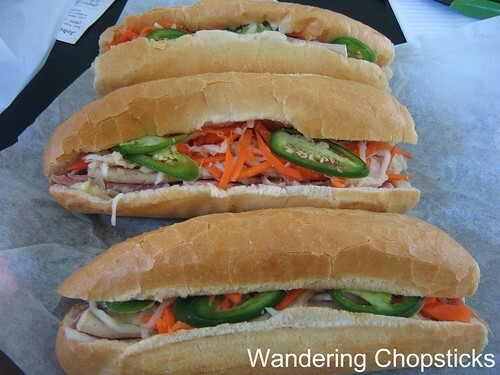 Banh mi (bread) is also used to describe Vietnamese sandwiches. (Similar to how the word com (rice) is also used for all meals.) Each location is slightly different, of course. I still prefer the Bolsa/Magnolia location best for quality and nostalgia, but it's a madhouse there. You just gotta elbow your way in to place your order and keep your ear attuned to when it's ready. 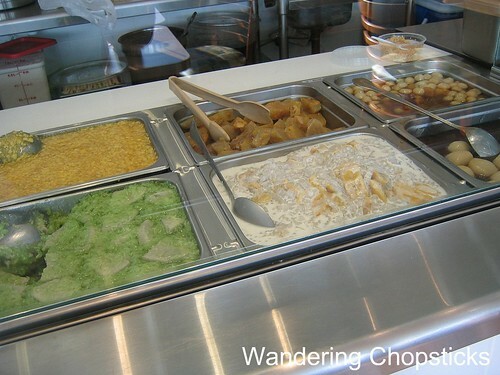 The Alhambra location is different from the others as it is a sit-down restaurant and not just a to-go place. And at this location, that's the best advice. The staff is all new so your order may take a long while or get messed up. It's only been a few months though so be patient while they learn the ropes. 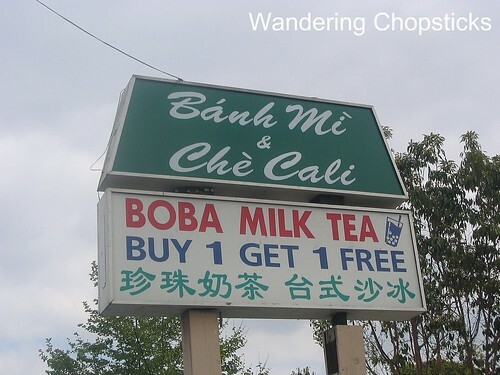 Of course, with 2 boba milk teas for $2, there's not a whole of error or expectation. 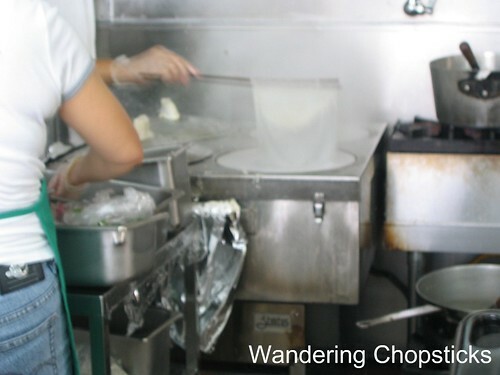 Their other specialty is che (Vietnamese dessert soups). 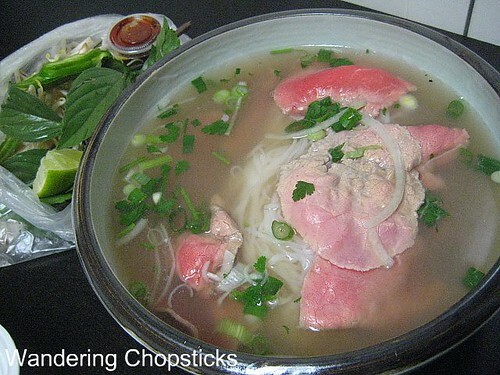 My previous explanation of che can be found in my Thach Che Hien Khanh - Westminster (Little Saigon) post. They're usually 3 for $2 so you can easily experiment with different flavors. 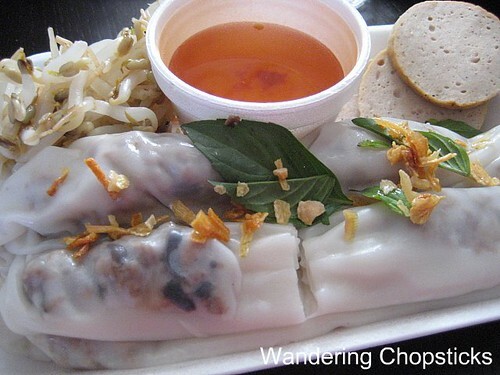 They also have a variety of to-go items, but this particular location steams their own banh cuon (Vietnamese rice noodle sheets stuffed with ground pork). Not the best I've ever had, I prefer the version at Banh Cuon Tay Ho, but pretty darn good when you get it fresh. The banh cuon are made by pouring the batter over a cloth, then gently lifting the whole rice noodle sheet up with a thin spatula. You can watch the video. A full-screen view is available on YouTube. They also make their own Nem Nuong Cuon (Vietnamese Grilled Pork Patty Salad Rolls) but I'd stay away from these. The nem nuong is pretty bland, the rice paper is almost always broken, and the sauce is runny. Of course, if you're really hungry, you can't beat 3 rolls for a little over $2. And the shrimp is at least fresh. So caveat emptor. I would suggest sticking with their banh mi and che, but at only a buck or two, you can experiment with their other offerings too. They also offer baguette bread, but I prefer the Vietnamese French bread because the sandwich is really yummy re-toasted the next day. Their plain baguettes are nice and buttery and only 85 cents. February 3, 2007 Update: On a cold and blustery night when I had a craving for Pho Bo (Vietnamese Beef Noodle Soup) but didn't feel like making any, or going out for it, I remembered that this location had some for pretty cheap. 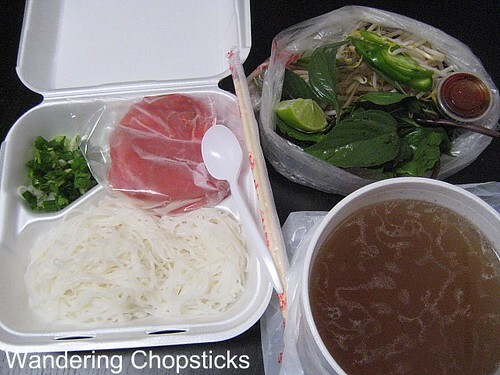 Only $4.25 for the pho tai (Vietnamese beef noodle soup with sliced beef) to-go. The broth was piping hot and double-bagged to prevent spillage. I got a container of noodles, sliced beef, chopped scallions, onions, and cilantro. A baggy of Thai basil, bean sprouts, lime wedge, and a container with both Sriracha chili and hoisin sauces. I was really impressed with the quantity of food. I poured everything in to a large bowl and was pleasantly surprised to find 9 slices of beef. The broth tasted light but very beefy. For a quickie pho to-go, I was very happy. I also got three che - che sam bo luong (Vietnamese dessert of dried longans with dates, lotus seeds, and white fungus), che troi nuoc (Vietnamese rice ball dumplings), and Che Bap (Vietnamese Corn and Tapioca Pearls Dessert) with a side of coconut milk. June 25, 2008 Update: While I'm at the checkout counter, sometimes I get suckered into buying other snacks as well. Everything below is in the $1 to $1.50 range. Banh pate so (Vietnamese pate chaud pastries). Also, buy 2 get 1 free. The croissant is nice and flaky, the filling is a slice of ground meat instead of a free-form patty. 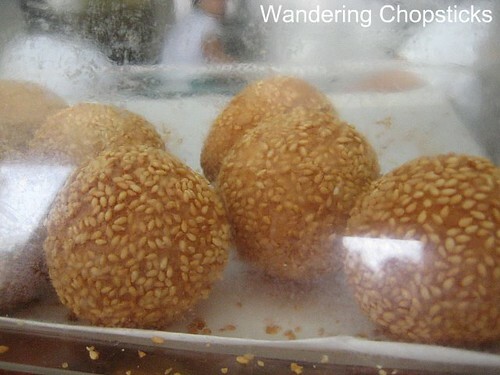 Banh cam (Vietnamese sesame balls) with mung bean filling. Banh tieu (Vietnamese fry bread). Anyone got a good translation for this one? Tieu is also the word for pepper, but I can't see how that applies here unless that refers to the sesame seeds. They're hollow, similar to Native American fry bread so that's how I'm translating it. The store-bought kind have always tasted a little stale to me. I prefer my mom's, straight from the fryer when it's still crispy and light. 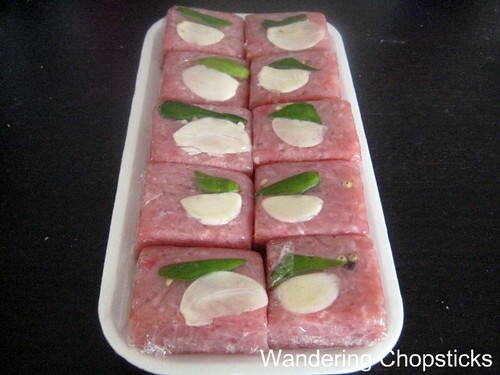 Banh bo (Vietnamese steamed rice cake). 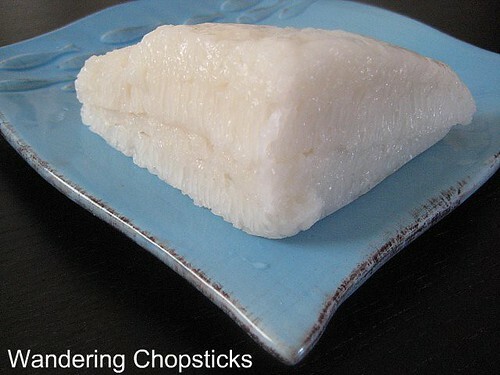 Banh gio (Vietnamese steamed rice dumpling). 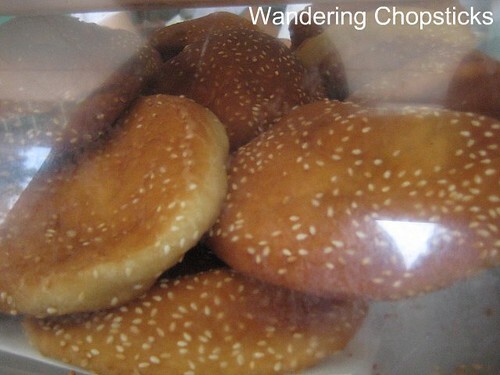 Get these first thing in the morning, when they're straight from the steamer. 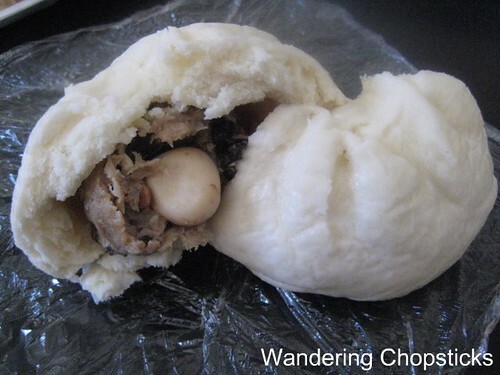 The rice dough is incredibly soft and tender, filled with ground pork, Nam Meo (Wood Ear Fungus), shrimp, and a quail egg. 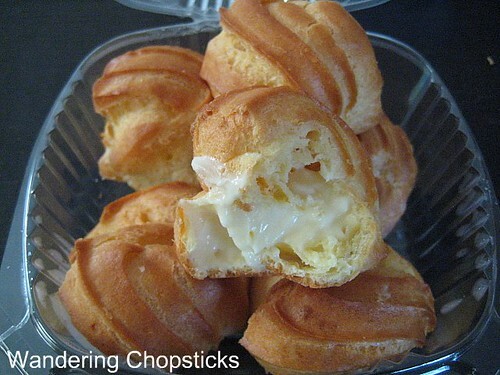 Banh xu (Vietnamese cream puffs), 25 cents each. 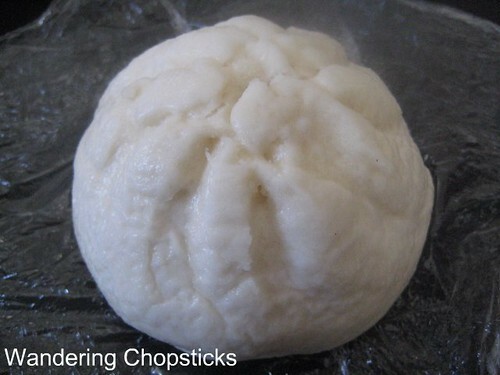 Banh bao (Vietnamese steamed dumplings). The filling is ground pork with a quail egg. Nem chua (Vietnamese fermented pork sausage) for $5. 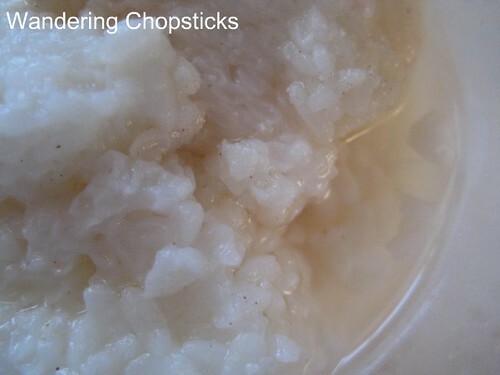 Com ruou (Vietnamese rice wine pudding) for $1.50. 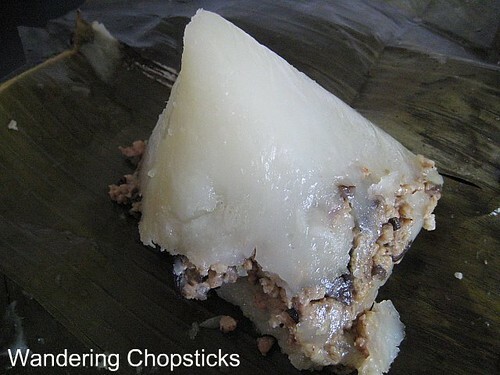 I've also posted about their banh tet chuoi (Vietnamese sticky rice cakes with bananas). This location also caters, which I used for the family wedding home ceremony and my dad's 60th birthday party. Interesting how she did the rice sheet. Seems so easy but takes lots of practice to do what she did. Hey WC - That banh mi statement cracked me up. I got into a discussion with someone who insisted that banh mi was a specific sandwich with only one specific type of meat(BBQ Chicken??? who are you kidding!) In other words his banh mi, was a specific banh mi! ;o) Must say the bread looks nice and crusty!! After she lifts it up, someone else has to roll it with meat inside. I'm not quite that skilled! Ya gotta have cilantro in the banh mi! What're they thinking?! You are a phone video QUEEN! I know! Maybe they'd add it if I requested it? Can you believe there are people who don't like cilantro? Not phone video, just my regular old digicam. You gotta come down for a visit so you can eat to your heart's content! 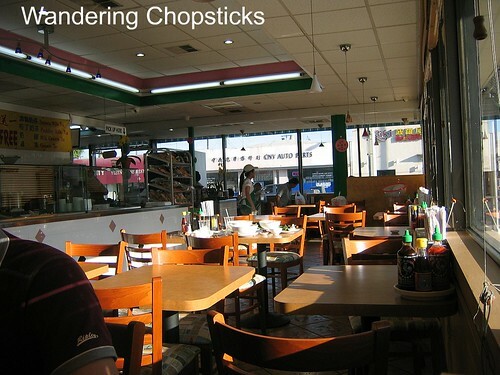 I like the Alhambra location better! The one in Rosemead is so crowded. Plus some of the women who work there treat me like crap until they realize that I speak Vietnamese and then they become super nice. The parking at the Rosemead location is just insane. Plus, they have a C rating there! Which che? They make so many. I think their che is a tad on the too sweet side, and much prefer Hien Khanh but it'll do in a jiffy. 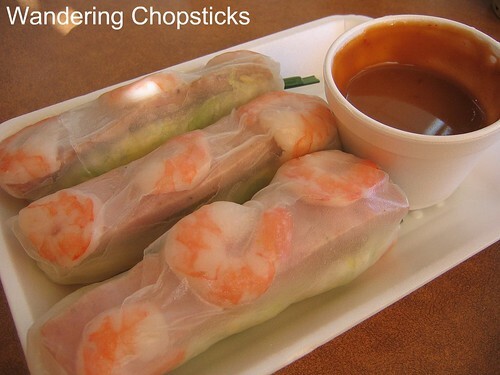 Hi do you where in SoCal I can buy a banh cuon pot? I´ve googled all over and no luck. Thought you might a shop that sells one. Thanks. I've never heard of a banh cuon pot. What does it look like? Most people just make it in a pan. I have plans to rig one that I'll have to see if my idea works. Haha. I know exactly how you feel. That buy 2 get 1 free deal is why they're springing up all over the place. 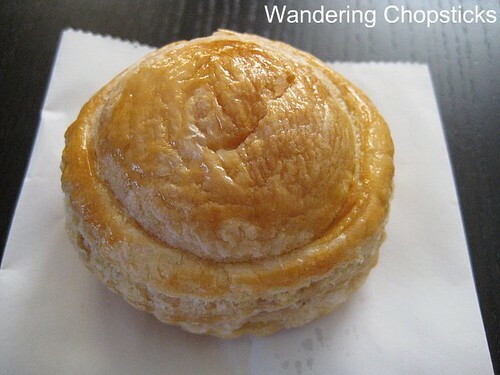 Does Alhambra banh mi Che Cali sells cream puff still? I've been here a couple of times and impressed by the fact that they bake their own banh mi. Not many restaurants do. It's been so long that I didn't even remember they sold cream puffs here until I saw my own photo. So no. I haven't seen them for a long time. I really consider this location a bakery that has an eat-in area. So they should make their own bread, although I know not all banh mi shops do.